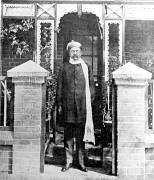 Gopal Krishna Gokhale, c. 1910. Gopal Krishna Gokhale (front row, centre) with a group of people, c. 1910. 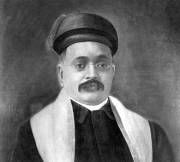 Painting of Gopal Krishna Gokhale, c. 1910. Gopal Krishna Gokhale, October 1912. Death bed of Gopal Krishna Gokhale, February 19, 1915.